Postal matches originated as early as the 1900’s with gun clubs in different parts of the country holding standardized NRA Bullseye matches (pistol and rifle). The shooter’s scores are mailed to a person responsible for tabulating the scores (hence the term, Postal Match). All of the scores from the participating clubs are then compiled and the results mailed back to every participating gun club. Each competitor is therefore, competing against all of the contestants in the participating gun clubs, making it a world-wide match. NOTE: Next Postal Match TBD. Below is how the 2014 Postal Match was conducted (expecting changes for the next match). The 2014 SASS Pony Express Postal Match Championship wass conducted in much the same way as it started with the exception of shooting 8 stages instead of 4 and with the exception of using computer-based scoring and email instead of the US Postal Service. The stages were relatively simple and precisely diagrammed so that all of the SASS clubs participating could set up and administer the match in the same manner. The postal match stages were shot at the club’s monthly matches over a period of 6 months (or as an extra match…decision by the match director). The Match Director had the option to shoot the stages on one weekend or shoot them over a specified number of months. For example, the Match Director could set up 4 of the stages one month and the other 4 stages the next month. Another option would be to shoot 2 stages per month over 4 months with two months used as a “rain date” in case weather causes a match cancellation for one of the match dates. No matter the number of stages, the Match Director decided when to shoot the stages (of course with all the scores turned in by a specified date). The SASS Pony Express Postal Match Championship wass sanctioned by SASS and sponsored by the Doily Gang. Only official SASS categories were scored and all SASS rules applied. Note: The postal match of course was not be like other postal matches that cowboy shooters are familiar with. It was expected that not all clubs had exactly the same target sizes, table sizes, props, running surface, etc. It was also expected that not all clubs wanted to participate. Due to the nature of the match being shot at different times, different places, placement of props, etc., there was inevitably minor differences. However, the stage design and prop placement was designed to minimize these differences. So why have the Postal Match? To benefit the SASS Scholarship Fund. This match was not a for-profit match for the Doily Gang but instead, a portion of the fees (all profit) benefited the SASS Scholarship Fund. The registration fee for the match was $25. The normal $5 fee per shooter for SASS was included in the fee as well as an extra $5 per shooter towards the scholarship fund. The remaining $15 went towards other expenses (awards, cost of mailing awards, PO box, and checking account costs). Funds from the remaining $15 less the listed expenses also went towards the SASS Scholarship Fund. The purpose of the survey to the match directors was to determine how many clubs would be willing to participate in a Cowboy Action Shooting™ Postal match. The Doily Gang presented the concept of the Cowboy Action Shooting™ postal match to the CEO of the Single Action Shooting Society®. The response was that SASS would fully support the match. We didn’t want to put a tremendous burden on the match directors when participating in this match, so we requested their feedback via the postal match survey. The survey was sent to the match directors April 19 – May 20, 2013 (a 5 week time-period). The results of the survey helped determine how many stages would be shot in the postal match, over how many months, suggestions for awards, etc. Due to the responses received from the survey and other input outside of the survey, it was decided to go ahead and pull the trigger, so to speak, to have the postal match. This was announced at the 2013 EOT opening ceremonies. The SASS Pony Express Postal Match Championship was sanctioned by SASS, following ALL sanctioned rules. See the SASS RO Level 1 and Level 2 handbooks at www.sassnet.com. Scoring was based on Rank Scoring. Shooters desiring to participate in the Postal Match had to be a SASS® member. Shooters were responsible for their own safety on the range and those around them, including eye and ear protection. Shooters could NOT shoot the match scenarios at one club without the scores being submitted to the Postal Match Scoring Official. This was to keep shooters from trying to have their best times submitted. By registering, the shooter agreed to their information (Alias, SASS#, Category, and Location) being posted on the website as a shooter and/or a winner. The shooter’s mailing address and other information were only used specifically for the match. The shooter’s email address or any other personal information was not sold or given to vendors or other third parties without explicit consent from the participant. SASS® and the Doily Gang™ reserved the right to disqualify any shooter or club which did not comply with the specified stage scenario or the specified target placement. Typically, this is only done for obvious violations. HAVE FUN (consider why we are doing this) … to raise funds for the SASS Scholarship Fund. For the 2014 Postal Match, there were 8 stages with specifications available on the website (in PDF form). The stages were shot over a 6 month time frame. Being that there were 8 stages, clubs needed to determine how many of the stages were to be shot on a particular day. As an example, the match director may have decided to shoot 4 stages in one month and the others the following month; or the stages could be spread over the 6 month time frame. Participants had the choice to shoot some stages at one club and the other stages at other clubs. Due to the nature of this match being shot at different times and different places, there were inevitably minor differences between target sizes, distance, and placements, etc. However, the stage layout is designed to minimize these differences. Targets were of the same size at each range (with the exception of shotgun targets). A survey was sent to the match directors to find out the most commonly used target sizes. Based on the survey, the pistol/rifle target size will be the SASS recommended size of 16 x 16. 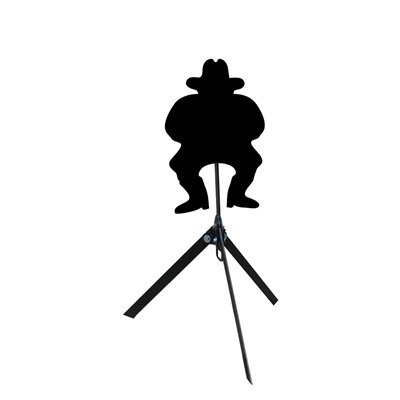 The SASS cowboy targets were also allowed as shown in the picture, but the main target shooting area couild not be larger than 16 x 16 between the top of the cowboy legs to the rim of the hat (see picture). The color of the pistol/rifle targets were painted black or red, as designed on the stage setup specifications. The shotgun target specification was of different sizes due to their being uncommon shotgun targets at the clubs that responded to the survey. Swinging shotgun targets were not used; only knock-downs. Recommended calibration for shotgun targets: To be taken down with a pistol round with a power factor of 60 from 8 yards. The scores were submitted by the Match Directors (or designee) to the Doily Gang. There was a chance participants could shoot the same stages multiple times (which was ok), but only scores for the initial time were scored. This is why it was necessary for Match Directors to turn in the scores for all who participated in shooting the Postal Match stages, not just those shooters who stated they were registered for the postal match (within 7 days of the match). By doing it this way, it took the burden off of the Match Directors for keeping track of postal match participants. The Postal Match Scoring Official used the SASS Scoring program to input the shooter’s scores. Total time could produce ties, so the normal SASS rank scoring was used. Based on the survey responses and to help reduce the chances of ties, the decision was made to have 8 stages for the match to justify Rank points (fewer stages increases the chance of ties). Note: If a shooter was unable to shoot certain stages, then a DNF was scored. SASS Championship Belt Buckles for overall Top Male, Top Female, and Top Junior winners was awarded. Additionally, SASS contributed $500 in SASS Merchandise Gift Certificates to use as prizes. These certificates were in $20 increments (allowing for 25 drawings). All participants’ names were placed in a hat for a random drawing. The cost of awards was one of the biggest expenses of a match and the more awards given out, the higher the cost of the match. Therefore, to keep the cost of the match down, all participants received a heavy duty 3×6 bicycle tag with the Postal Match design imprinted upon it (shooter had option to affix their category placement on the tag). All participants also received a certificate via email (with their category placement).